As we discussed in last week’s newsletter, October was a difficult month for the U.S. equities markets. In particular, tech was hit hard as the Nasdaq Composite fell almost 10%, closing out its worst month since the 2008 financial crisis. However, tech companies that went public in the U.S. this year are still up 22% on average through the end of last month, which compares quite favorably to the S&P (up only 1.4% for the year) and the tech companies that comprise the S&P (up only 9.9% for the year). According to the Wall Street Journal, as newly-public tech shares continue to outperform the general market and their tech peers, these companies have also returned to the public markets for additional share offerings at a record rate. 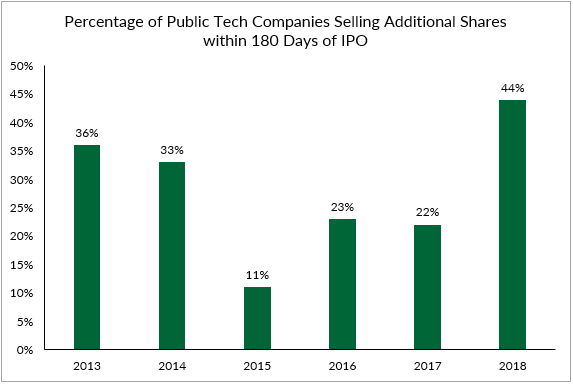 In 2018 so far, 44% of newly-public tech companies have already returned to the public markets to sell additional shares and did so within only 180 days of their IPO. This represents the second highest level of companies doing so since Dealogic began tracking these data in 1995. The continued success of new issues has been accompanied by another market phenomenon—tech companies are selling as little as possible of themselves on the public float. This year, newly-public tech companies sold only 17% of themselves on average in IPOs, which is the smallest proportion on record. Given how much private capital a typical tech unicorn now receives before going public, it’s not surprising to us that tech companies are now offering fewer shares in their IPOs than at any time in history. This phenomenon is of course helpful to prior shareholders—founders, employees, and early investors—who can now expect less dilution if and when their tech company goes public, which of course is no longer a certainty as the number of public companies in the U.S. steadily declines. The prevalence of successful follow-on offerings for these newly public companies adds to the narrative that tech stocks are still a scarce resource, and public investor demand is high for exposure to the tech industry. Moreover, we believe it is unlikely that supply will match investor demand, as we continue to see subdued tech IPO activity into 2019. Information compiled by Renaissance Capital indicates that priced IPOs in the U.S. are still nearly 100 fewer this year than 2014’s high of 275. With the consistent influx of vast amounts of private capital into the tech ecosystem, our bet is that we won’t be matching 2014’s IPO high in 2019 either. Part of the reason we started EquityZen is exactly due to this supply and demand mismatch. In creating the platform, we are democratizing the supply of tech company shares for a much larger percentage of the U.S. population that has been unable to gain exposure to these companies in the public markets. Five years since our founding, we continue to see data that supports the need for our mission.